When we think of literary symbols, the “signified” meaning of a symbol is often taken from very specific sources: Shakespeare or Charles Dickens, Faust or the Bible. Especially the Bible. Which brings in the concept of water: In most writing, water is refreshing, it brings in the concept of birth, life, and baptism. In horror, very rarely does water reflect this concept. Water signifies many things in horror, but mostly it represents the symbol of the unknown and unknowable. Look to H. P. Lovecraft and his “Cthulhu Mythos” which respect to many of his Elder Gods–although there are Elder Gods for each element, most of the ones Lovecraft writes about are his gods of water, living deep within the sea. 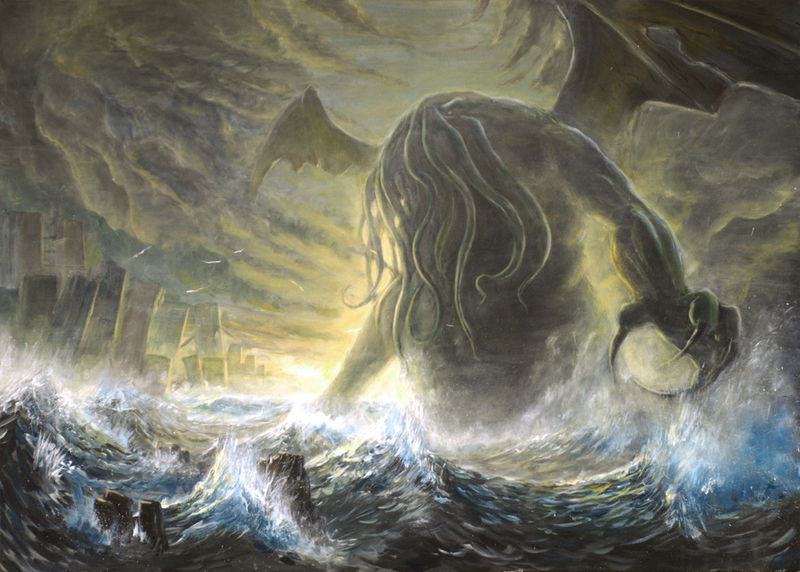 There is his Dagon, Cthuhlu, and Mother Hydra, references in various stories, most notably one of Lovecraft’s few novellas The Shadow Over Innsmouth, which heavily plays on the concept of water, not just because of the gods that dwell there, and the ocean-side locale, but because (spoiler alert) the people themselves are of the sea: They are strange, and unknown to the world around them, just like the deeps of the ocean itself. To put this in the perspective of film: We have Jaws, Godzilla, The Abyss and even Sharknado. All the evils in these films come of the water–some even reflecting upon real threats (after all, Jaws was based real shark attacks). The idea of unknowable water plays off truths we all know: The ocean is vast, it is scary, and there is much of it we still don’t know, and because of this it becomes a natural symbol in these films and novels. Sean Hall, in This Means This, This Means That, expands on this point: He states that there are two ways symbols can arise, natural and cultural, and while there are plenty of movies that play on cultural fear (The Exorcist, and other movies based on religious concepts), movies involving water are often purely natural in how they encourage emotions in their viewers, especially “creature” films, like many of the aforementioned movies (and even Lovecraft stories) are. In a cultural context, water in clean, pure, and baptismal, but once there is enough of it, the fear of what lurks calls to our most basic of instincts. Which goes back to an overall theme of horror: Whether it be woods or water, abandoned hospitals or lost islands, the idea that were is some unconquered unknown appeals to our fears, and becomes a symbol for it. I find sea-monsters of all varieties intensely frightening because when something is hunting you in the water, you can’t see it and you can’t use your normal faculties. But I think the depths and unexplored nature factors in, too. Oceans are such loaded devices. It’s in the mystery of huge bodies of water and forests that we let ourselves believe in things, even if just for seconds at a time. The myth of the Loch Ness Monster couldn’t be perpetuated if it were in a small body of water, nor could Bigfoot be in a small patch of woods. Not only does unexplored nature represent the mystery, but it also facilitates it.